Waited at my pick up point 15mins early. Tour guide was not there on time, I was getting a little worried, so I tried to text the cell that was provided, but no reply. He finally came on a motorbike, so there were no where for a shuttle to stop at this pick up location, because of the traffic. Once he located me, he called the shuttle van to pick me up. Picked up a few more people at a hotel and headed to the temples. This is a very short duration tour for the amount of things to see, so time is very limited at each location. Amazing Temples Tour! We could've did without the Gem Gallery at the end of the tour, this is a shopping tourist trap. Guide leads you to the entrance of the Gem Gallery, you're whisked into a room to watch a short film, then whisked into the shopping area.....felt like we did not have a choice. Sales people were very aggressive and rude when you tell them you're not interested in buying anything. I walked out, found my guide and he pointed me to the shuttle to take me back to my hotel. I had to wait about 20min, as the driver was talking and smoking. 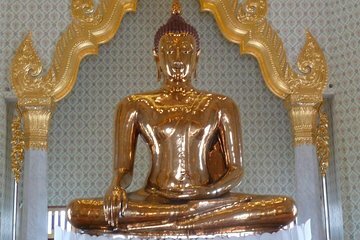 With such a limited time at Wat Pho, I ended up going back on my own, as they also have a Massage School, which was worth it. I really enjoyed seeing all these temples, it was very interesting to learn about them, our guide was really good, and they are so beautiful. I don't recommend this. The temples themselves were fine but the guide was pretty shady. At the end they took us at a jewelery place which is not mentioned anywhere and we spent there like 1 and a half hours with no option to get out of there, the area is remote and cabs were passing by... big no! Absolutely gorgeous! The tour was run so smoothly and the guide was very knowledgeable. This was a great tour for us. We went on Dec. 31st, and our guide mentioned several times how lucky we were to have little traffic or other tourists. This tour typically has 30 - 40 people per our guide's information and there were only 9 of us that day. Nice! The sites we visited were beautiful and well worth this short tour length. For us, we really only cared about seeing Reclining Buddha amazing!, but the other two temples were equally impressive and worth visiting. Note: You'll visit a gem store at the end of the tour. We had no clue we'd end the tour here, but if we had, we would have brought more money. If you are looking for gold, diamonds, gems jewelry galore!, handbags, skin products, etc., you'll find benefit in this final stop. If I had to sit in hours of traffic or be in the midst of hundreds of other tourists for this tour, my opinion would have changed slightly, simply because that would have been a level of frustration. Our guide mentioned that this tour can take anywhere from 2 - 3 hours, and we were 2 hours start to finish. For us, this was the perfect way to visit these temples! 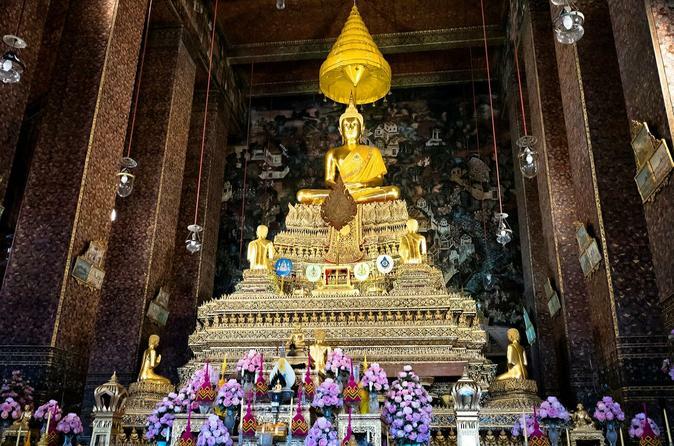 These temples are a must see and it was very convenient to go with this tour group with the knowledgeable guide. Very convenient being picked up and dropped off at my hotel. There is so much beauty on this tour and my guide did a good job of teaching us the basics of the temples we visited. It was really too much information to absorb at the time, so I focused on getting some great photographs and will do some research later to put everything I saw into perspective. This small group tour mine had 7 adults and 2 kids was a great way to see all of these attractions in a short period of time. Be sure to dress modestly for entering the temples, and expect to remove your shoes. It was very good experience with excellent english speaking tour guide. He provided lot of background info around bangkok and then each of the temple. There was enough time given at each temple to explore. Free water bottle was provided and lots of opprtunity to take pictures throughout the trip. I cannot rate the tour as waited for 2 hours in vain. What a shame as I was really looking forward to this. The Rendez-Vous point was Sathorn pier. This is a huge place with a lot of traffic and passage of all sorts no specifics point was given. I had an information guide on the pier to call the tour operator. I was told that someone was coming to collect me but lets say we missed each other.